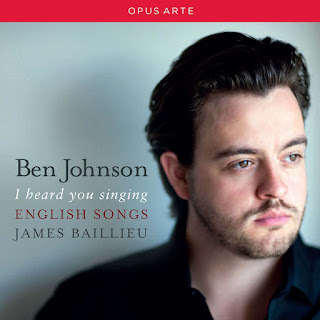 This new disc from Rosenblatt Recitals on the Opus Arte label presents tenor Ben Johnson and pianist James Baillieu in a recital, I heard you singing: English Songs, in repertory which reproduces their live Rosenblatt recital (see my review). Johnson and Baillieu's repertoire on the disc ranges over composers writing in the late 19th and early 20th centuries with an emphasis on the rather neglected form of the English ballad. The composers range from those active in light music through to those writing art songs, from Edward German and Eric Coates to Stanford, Elgar and RVW. Many like Michael Head, Amy Woodforde Finden, Liza Lehman, Muriel Herbert and Ivy Mason Whipp made a speciality of writing songs. Thus the composers come at the ballad either by way of the salon and the parlour ballad, or by way of the art song. But all the songs on the disc need a strong technique to bring them off. Because the subject matter is lighter or in sentimental vein doesn't mean that performers get an easy ride. Ben Johnson not only bring an enviable technique to the disc, with a lovely ease to his voice and a burnished sense of line, but he sings with exemplary diction and clearly means the words. Ben Johnson and James Baillieu pay the songs the compliment of taking them seriously at face value and this pays real dividends. They start with Edward German's Orpheus with his lute, a civilised lyric song full of elegant melancholy. In Ivy Mason Whipp's Woo her gently Johnson brings a shapely sense of line to bear, decorated by Baillieu's piano. Eric Coates' Betty and Johnny is a suggestive comic delight, whilst James Baillieu has great fun with the bird song in the piano in Bird Songs at Eventide. Edward Elgar's Pleading is one of his finest songs; a ballad, but full of subtlety and emotional depth. Sullivan's The Lost Chord is a prime example of the genre, and easy to send up, though that certainly does not happen here. Thomas Dunhill's The Cloths of Heaven has an attractive wandering melody and the performers' intimate delivery develops into a magical hush at the end. Samuel Liddle's How lovely are Thy dwellings fair sound strikingly religious to us, but some ballads were and Liddle's song is very hymn-like. Michael Head's The Little Road to Bethlehem keeps the mood but brings a very English 20th century sensibility. Ben Johnson and James Baillieu give a subtle performance with Johnson producing a lovely mezza voce. Amy Woodforde Finden's Till I Wake combines hints of the exotic (India) with a great deal of sentiment, but Johnson gives a lovely seductive performance. Liza Lehmann's Ah, moon of my delight also evokes the exotic (Persia this time), in a big hearted if sentimental song. Herbert Hughes arrangement of the Irish traditional song The Stuttering Lovers is a very non-PC delight rendered brilliantly by Johnson. Two more Eric Coates song come next. The elegant romanticism of I heard you singing and the rather low key but still elegant Shakespeare setting Tell me where is fancy bred. Stanford's A Soft Day is full of lovely subtle charm whilst Liza Lehmann's Belloc setting (one of his Cautionary Tales), Henry King, is wondrous comic delight, though If I built a world for you is more straightforwardly sentimental, but I loved some of the imagery in the poem. Muriel Herbert's To Daffodils comes as something of a shock to anyone who knows Britten's vivid setting. With Wilfrid Sanderson's Until we return to the sentimental vein, but Amy Woodforde Finden's Kashmiri Song has the advantage of a seductive melody with hints of the exotic again. Finally RVW's Orpheus with his lute brings us round again in lovely fashion. Both Ben Johnson and James Baillieu bring superb technical skill to the disc. Occasionally the recording catches a hint of hardening in Johnson's voice which is not there when heard live. But overall marvel at the beauty of tone, control and lovely mezza voce. There is quite a lot of sentiment and sentimental song on this disc, but it works because Ben Johnson makes you believe every word.